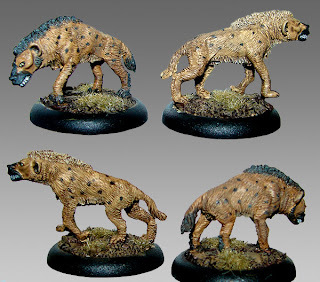 This time I’m painting a pair of Reaper Hyenas. Pretty traditional here. I based coated one of them with Tanned Leather and the other with Amber Gold. Then, bring on the wash. GW has a new line of ready-use washes and I picked up the set earlier this year. I covered both of them with Devlan Mud which soaked into the recesses really bringing out the fur. I then mixed up a thin mix of Earth Brown and Brown Liner. I spotted the beasts and added some fur trimming to one of them. A added a little more liner to darken the mix and painted the faces. Some Amber Gold dry brushing over everything with a little thicker on the others trim. Light Yellow eyes and some Linen White teeth and its all over. I’m not very good at painting fur, but the GW Washes are amazing for something like this. I should have spent more time preparing the models, but the end results is not bad for such a quick job.